Minions from Despicable Me 2! Have you watched the movie yet? It appeared on the TV several times that I could hear my son humming the tune all the time. 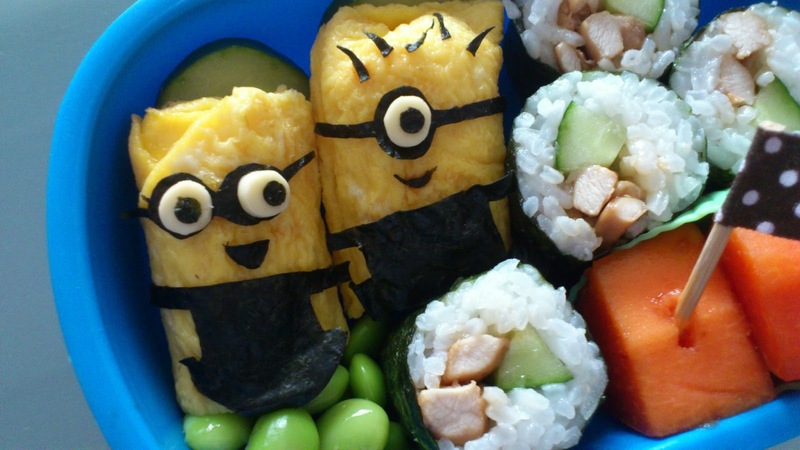 The Minions are made of tamagoyaki (using one egg and almost burnt ;), seaweed and cheese for the details. In the box, my boy has teriyaki chicken sushi, edamame, Japanese cucumber and papaya. It has been a week since the school reopened. And I begin to follow the news of Primary school registration for 2014. Because, next year it's our turn to register our son for 2105. On the other hand, I also start to worry about his Mandarin. 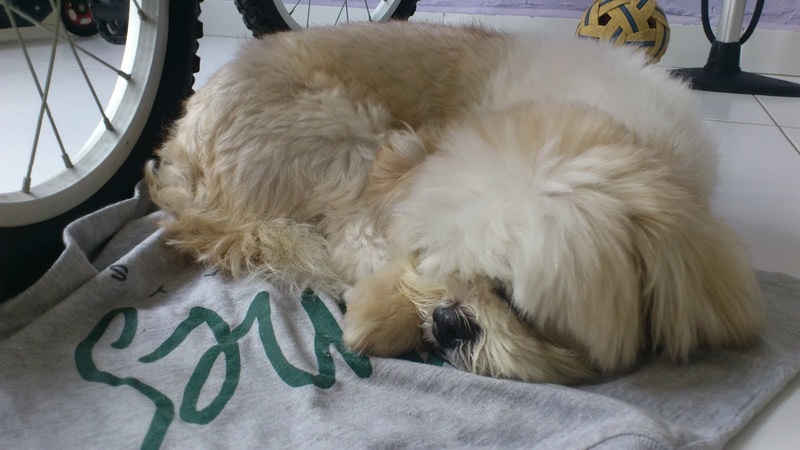 Although he remembers and recognises the Chinese characters, he is still weak in the spoken language. And often or not, he will pause and tell me that he does not know how to say in Mandarin. I have designated Thursday and Friday, Mandarin speaking days. I know the progress has been slow and still not good enough. And I have an urge to send him for Chinese enrichment class. It is amazing how much the kids could absorb under a rich Mandarin speaking environment and the ability to recite 三字经 (Three Character Classic or San Zi Jing). (Kiasu symdrome kicks in....) But then, we do not wish to give him any pressure for fear it may kill his interest. He learned better through play and of interest to him. We have never sent him for any enrichment after class except school holidays program. I feel a little distracted and I need to stay focus on what we believe is the best for him. OMG I just saw this, the minions are so cool! 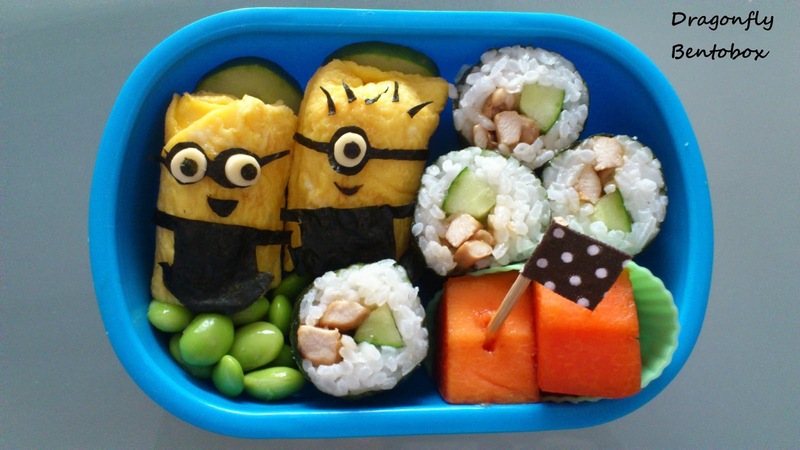 It seems like you can create ANYTHING with your bentos, salute! =) For my girl, it's the opposite case with her languages. I used to teach at Berries and because the hubby and I speak Mandarin, so we also talk to her in Mandarin since young and her command of the language is so much better than her English! =) Yes, we also taught her san zi jin too at the age of 3 but it was more for the fun of it to recite together. =) Hope your boy will love Mandarin and enjoy learning it! =) Thanks for linking up! Summer, Thanks for the kind words. Guess, we can't have the best of both worlds. We started English speaking at home for both my hubby and myself. 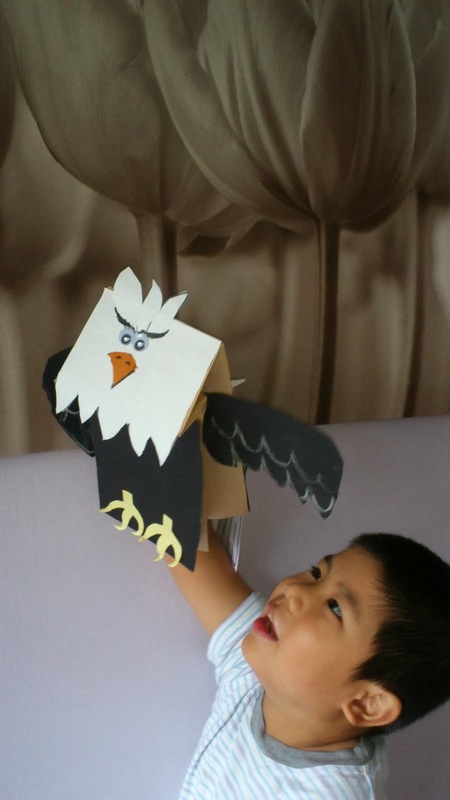 Hence, my son does not expose to Mandarin very much except in school. Hopefuly,the educational system will not be so taxing when he enters Primary school. Such clever minions - and cute to boot! Congratulations! This was picked as Bento of the Week at Bento Blog Network. It has been pinned in the Featured at BBN board at Pinterest, Tweeted, and Recommended on G+. Please grab a featured button off the sidebar. Thanks for sharing this awesome bento! Thank you Jackie for dropping by.